Madeira Park, in Pender Harbour, has the last fully stocked grocery store I’ll be at for another week at least. So, on my way out of Pender Harbour this morning, I stopped in and grabbed a few additional food items. Then I was off, at about 10:00 am. Inside Pender Harbour the weather was pretty calm, with only light winds. 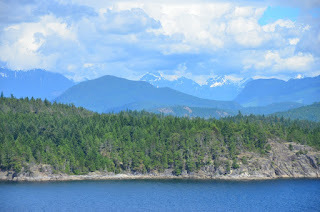 But as I exited I saw Malaspina Strait was lumpy. 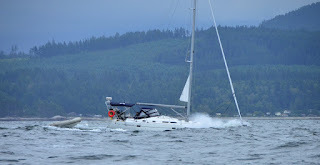 Lots of whitecaps, and a good 20 knots of breeze from the southwest. This put the 4-foot seas on my port quarter. The ride was reasonably comfortable, but the autopilot sure worked hard to maintain course. Surfing down the waves speed climbed rapidly, sometimes as high as 18 knots, only to drop as low as 6 knots when climbing the back of the next wave. All this without touching the throttle! 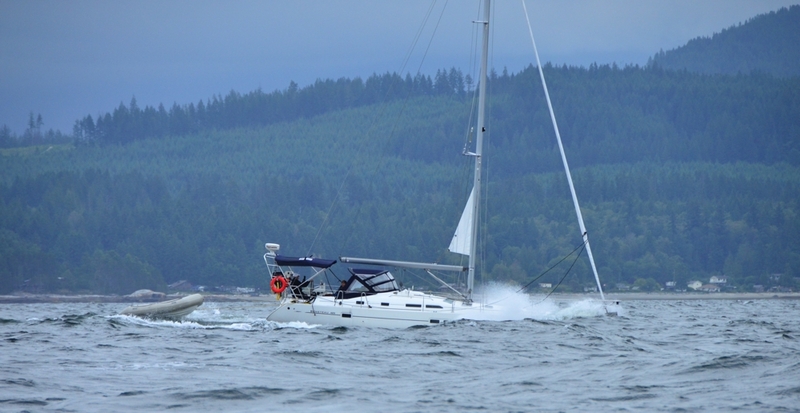 This sailboat was traveling the opposite direction, and had a rough ride. 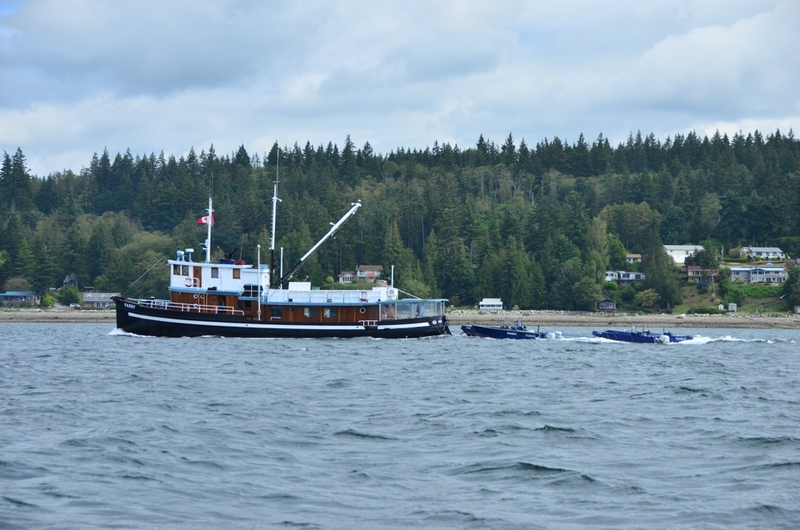 I passed Parry, a charter fishing boat I saw last summer around this time at Bishop Bay. were down to 1-footers by the time I reached Powell River. I picked up fuel in Lund (22.7 gallons at $5.16/gal) and was pleasantly surprised to see I averaged better than 3.7 nmpg. From Lund I made my way to Cortes Bay, on Cortes Island. Several boaters I know have encouraged me to join a yacht club. I was hesitant at first. For one thing, my C-Dory is hardly a yacht. I assumed that any yacht club would be a stuffy, blue blazer kind of place—not really my jam. And the cost! Anything with “boat” in the name is expensive, let alone “yacht!” Over the winter I explored the possibility further, and was pleasantly surprised with what I found. Ultimately I joined Seattle Yacht Club. It’s very inexpensive for someone my age, and membership comes with many perks. Outstations and reciprocity are the two biggies for me. Tuesday night I stayed at Royal Vancouver Yacht Club. Last night I stayed at Seattle Yacht Club’s Garden Bay outstation. And tonight I’m at the Cortes Bay outstation. All free, including showers, electricity, water, ice, WiFi, etc. If I spend 10 nights a year at outstations or reciprocal clubs instead of commercial marinas, I pay for my annual dues! I walked a few minutes from Cortes Bay for this view. So far the people I’ve met have been friendly, helpful, and far from snooty. Tonight the outstation managers picked up pizza in a nearby town for me and the other two couples here, and we all (including the managers) had dinner together. It’s fun hearing cruising stories from others and learning from their experiences. 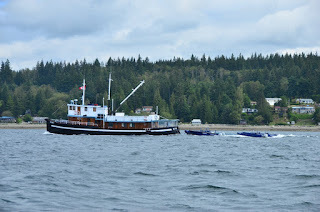 Tomorrow I’ll head to Homfray Lodge, a nearly new marina in Desolation Sound. Then I may continue to Toba Wildernest. Or not. We’ll see. Hi Sam, I am a longtime annual Waggoner purchaser and am enjoying your reports. I am particularly curious as to how the Koodo sim is working out in Desolation Sound. Are you shut out on reception much? Can you use the data in most places? We are planning a trip for August and were looking into Koodo's service. Sounds like a decent way to go for just a one month duration. Thanks and looking forward to reading more. Hi Pat, Koodo's service has been very good. Anywhere Telus works, Koodo works. The Koodo coverage map seems pretty accurate. I had good 3G service in Cortes Bay and through the entire length of Homfray Channel. Pryce Channel was spotty. Raza Passage was good. I'm at Stuart Island Community Dock right now with 5 bars of 3G. I didn't have service at either Homfray Lodge or Toba Wildernest (although it worked a few hundred yards out from both docks! ), but both marinas have WiFi. A cell phone booster helps, too. I've been testing a Wilson Mobile Pro. It gives a 2-3 bar increase in signal strength. I'd opt for the Wilson Sleek, though, since I have to put my phone on top of the Mobile Pro to see any increased signal strength. This is also true with the Sleek, but it actually has a cradle for this purpose.